How to Buy a New Or Used Car Without Getting Ripped Off (Quick Loans)! Car buyers can find auto financing to be difficult and intimidating. Why? It’s easy to get ripped off! Also, buying a car is one of the most expensive things you’ll ever do. New or used, cars just cost a bundle. Buying a New Or Used Car? Research, Research, Research! Is Getting Specialized Financing a Curse, or a Cure? How Do I Buy the Car I Want? People often don’t understand that a lack of credit history means a greater risk to the lender, which leads to a greater possibility of getting screwed over on your interest rates. For those who have been owned a few cars, this is no surprise. They have a much better idea of what the true costs will be when buying their second or third vehicle. Usually, they are able to get pre-approved faster as well because they actually have some evidence of a past credit history. According to major credit bureaus, credit scores are built on the number of accounts you have, the types of accounts (credit cards, mortgages, and other loans), the length of your credit history, and your history of paying for credit on time. New buyers fit into the bad credit category, simply because there isn’t enough information to go on. Since the length of one’s credit history can play a significant part in credit scores, this makes sense- no credit history plus no credit length equal to bad credit. The loan industry has been upset in recent years by the fact that, according to certain surveys, only about half of Americans pay their balances in full every month. Paying your balance on time, by the way, is the single largest positive influencer of your credit. It makes a huge difference to your credit score. Not paying on time leads to a decrease in the number of people who have good credit, and lenders have had to adjust accordingly. However, people who don’t pay on time do have the option of getting a second chance loan. At this time, about 25% of Americans have a poor credit score. This is a lot of people, and some lenders have begun specializing in these lending conditions. Of course, the same risks still apply- those with bad credit will always have a tough time finding good interest rates. First time buyers can easily get into this market, however, and if they have steady employment they will frequently be able to apply without the need for cosigners. Of course, there’s bad credit from a clean slate, and there’s bad credit from repossessions, collections, and so on. Bad credit from a clean slate is much better than a long history of poor credit choices. If you’re a student looking to get auto financing, check here for more advice. A sloppy credit record is much more difficult to deal with, but needs to be dealt with before attempting to get bad credit auto financing. This isn’t in the same league as bad credit auto financing for those with no credit history, and can be an expensive ordeal. However, those with a poor credit history can also use bad credit auto financing to their advantage, as auto financing is one of the most effective ways to build a good credit score. By the end of the loan term, if there have been no late payments and all obligations have been fulfilled, borrowers will walk away with a much better credit score. Making your way through the process of financing and buying an automobile can be difficult to say the least. If you have no credit or bad credit, this process can sometimes be more daunting. Consulting a provider of bad credit auto loans can give you the knowledge and resources to put you in the driver’s seat of that dream automobile sooner and with a lot less headache. Knowing exactly what you are pre-approved for eliminates unwanted surprises. The process of buying an automobile can be long and exhausting. Most buyers invest many hours researching and test-driving vehicles. Knowing exactly what you are pre-approved for allows you to focus your attention on what you know will be a suitable purchase that you can live with for years to come. Having a pre-approved auto loan allows you to focus on the actual auto deal and not your personal finances. How you are purchasing the vehicle and your monthly payment is none of the auto salesman’s business. Simply tell the salesman that you will not need financing and focus strictly on the purchase price. This allows you to concentrate on the actual vehicle. Auto salesmen are infamous for trying to up-sale or pull a fast one on unsuspecting buyers. Once you take the monthly payment and other financing information out of the equation, the salesman can only concentrate on the purchase price of the vehicle. After you become pre-approved for your auto loan from a company that provides bad credit auto loans, you are equipped with the knowledge and resources to put yourself in the driver’s seat to make the best deal possible on the best vehicle that fits your needs. Once you know your budget, you can concentrate on what features and options you need in your vehicle knowing that your finances have been reviewed and you have received pre-approval for your loan. It’s all about finding the right car at the right price. 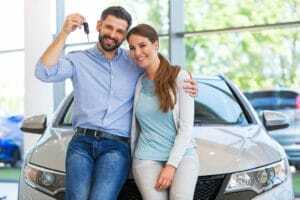 Becoming pre-approved for an automobile loan not only allows you to handle your finances responsibly, but is a sensible way to make sure that you are not taken advantage of by the “honest” salesmen on the lot. If you’d like to get approved for an auto loan, check out our free loan search tool. It allows anyone with lousy credit to get approved quickly with one of our many nationwide lenders. Once you are connected you of course still need a verifiable source of employment. Have a way to pay back the loan. These can all be taken care of by doing the right research and taking the time to learn about how the process works. People have financed everything from low cost vehicles, to high end luxury cars through these methods. It all depends on your current financial state, and the specific details of your past. higher loan amounts with potentially greater interest rates. Every plan has its advantages and disadvantages, though when you do go through the sign up process each of them should be listed. All you need to get a loan is your basic contact information, along with other important financial statements. You should be contacted immediately after you complete everything and the required paperwork will either be given to you right there, or provided by a qualified representative. These loans differ from traditional ones in the fact that they only require general information from someone and almost always give people the option of financing a vehicle at some point in time. Here’s a more comprehensive guide to the different types of auto lenders you can deal with. When you go through a traditional bank, you often need to have good credit in order to qualify for a decent loan. You can use bad credit auto loans to bypass this process so that you can get the vehicle of your choice hassle free.